WKMS-FM reporter Matt Markgraf in Murray, Kentucky, has a report out today that further illuminates the mind-boggling injustice perpetrated by universities on college basketball players. 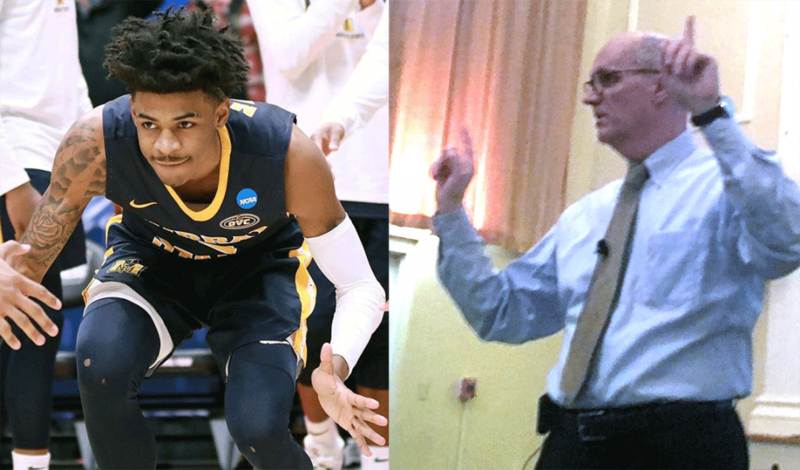 Murray State President Bob Jackson said Ja Morant and the Racers’ basketball run this year is worth about $250 million from a media standpoint. The Racers made it to the second round of the NCAA Tournament this year after winning the Ohio Valley Conference. Sophomore Ja Morant garnered significant national attention for his explosive performance, including the first triple-double since 2012. Jackson says Morant is a great ambassador for the university. “I got out to a lot of high schools and rotary clubs, as many of you do. What was the first question in Madisonville yesterday? Tell us about Ja Morant. Henry County, Tennessee, last week? Tell me about Ja Morant,” Jackson said. He said athletics is an important front-door for Murray State that allows the university to leverage its academics and history in different ways. He also noted the Murray State website is getting more hits now than it has in the past 20 years. The NCAA basketball tournament generates in excess of a $1 billion in television advertising revenue annually, eclipsing the TV ad spend on the Super Bowl and dwarfing the NBA and MLB playoff haul. UPDATE: Sports Director Jeff Bidwell of WPSD-TV in Paducah, Kentucky, has Murray State providing an even finer point on the financial benefits the school realized via Ja Morant’s compensation-free performance.